This year has been an excellent one for creative women in Ireland. Earlier in the month, WFT put a call out for our friends in the Screen Guilds of Ireland. We wanted to know about the successes that our members, and Irish women working in the audio visual sector, have achieved in the past year. The response we received has been so overwhelmingly positive. What better way to honour International Women’s Day than to celebrate these impressive achievements? Farah was nominated in 2017 for a BAFTA for The Party, has written an Amazon Best Seller on Filmmaking Rocliffe Notes. In 2018 she made the Netflix Original Irreplaceable You and the BBC-Amazon series The ABC Murders, out Dec 2018 (as well as several other features). Farah is currently in Malaysia making an adaptation of The Singapore Grip written by Christopher Hampton. She has also set up a new screenwriting initiative with BAFTA – the BAFTA Rocliffe New Writing Initiative – which launches screenwriters. Sonya is the director of the feature documentary Outtitude about the Irish lesbian community. This won the audience award at GAZE film festival in August 2018 and has screened at a number of festivals, including OUTBURST in Belfast, IndieCork, SQIFF in Glasgow. It’ll be playing at the Five Lamps Arts Festival in Dublin in April 2019, at Leeds Queer Film Festival in March 2019 and at Cinema Systers Film Festival in Kentucky in May 2019. Hello Brother, a one-minute short and debut film of Irish writer/director/producer Emma Brennan, won an award for Best Super Short NYCIFF 2019 at New York City International Film Festival (NYCIFF). The short had its world premiere at the Galway Film Fleadh last year in partnership with Galway Film Centre’s ‘One Minute Film Festival’. Funded by the Arts Council of Ireland, Oonagh Kearney’s new film Five Letters To The Stranger Who Will Dissect My Brain premiered at Cork International Film Festival in November 2018, where it won Best Director of an Irish Short Film. It recently screened at the Virgin Media Dublin International Film Festival, where it won Best Irish Short Film and Oonagh won a 2019 Discovery Award. Oonagh’s first feature screenplay Snow on Beara is in development with Screen Ireland. On her project nearly all the heads of departments (producer, PM, DOP, editor, sound designer, composer, costume) are female, as are the lead cast too. International Women’s Day 2018 saw the launch of Anne Marie Kelly’s Multi Media Exhibition, “Virgin Mother Whore…Woman”, at Filmbase in Dublin. With its foundations firmly and lovingly in her independent music, she used this launch pad to develop the characters in her songs around a twisted mythological triple goddess, portrayed through still image, 3D, and video. Alongside ran her photographic exhibition, Roots and Wings, which explores the therapeutic relationship between counsellor and client, sending us back to nature to find our pathway to emotional well being. This exhibition will be shown again in October to coincide with the Mental Health Awareness Campaign. In autumn of 2018, she filmed Ma, which she wrote, directed and starred in alongside Jamie McClean. This project won her “Best Actor” at Disappear Here Film Festival in Donegal in September. It was screened as part of “The Female Eye” and also featured in the Toronto Irish Film Festival. Its Dublin premiere took place on Wednesday, March 6th at the WFT Short Film Showcase. Rehearsals are already under way for her next short film, God Given Opportunity, which she has written and will direct. It is an artistic response provoked by conscience and released in dramatic tale seeking to artistically represent the battle between good and evil that took place over the last few decades as child abuse and its cover up tore the Irish Catholic Church apart. It was spawned during the Papal Visit of 2018. Maeve’s film Silent Grace was released internationally online via Kew Media and on Volta and was broadcast again on Virgin Media Television. Her short, Siobhan was shown at Garden State, Kerry and Foyle Film Festival and was also selected for IFI/WFT Showcase shorts. Global Network for Peace, her short documentary, was featured and an excerpt broadcast on BBC World News and shown to 6000 young people on 3 UK screens as part of SGI “Generation Hope” peace event. In the past year, Hannah directed 3 episodes of the Virgin Media series Blood, 4 episodes of Eastenders for BBC and is currently in prep for a Netflix series called The Stranger shooting in Manchester. Her short documentary Smithy & Dickie, which was funded by the IFB, was premiered at HOT DOCS and won The Consulate of Ireland award at Chicago Irish Film Festival. She was also the 1st A/D on the Irish film Rosie. A major personal achievement of hers was that she got her private pilots licence. Sarah Lynch has scored soundtracks across a wide range of genres including film, TV, animation and games. Her film/TV work includes the soundtrack to 2 x 51 min creative documentary episodes as part of the “Aerial Britain” for the Smithsonian Channel. Sarah is also currently providing additional music on a number of feature films for LA-based production company ‘E-Quality Music.’ She recently completed two RTÉ/EBU funded children’s short films: the award-winning All in Good Time and Girl at the end of the Garden (Dir. Bonnie Dempsey for Dyehouse Films). A highly experienced games composer, she is chief in-house composer for Warducks VR and AR studio and has provided the soundtrack for over six best-selling titles across mobile, desktop and console platforms. She is currently beginning work on a new game with Warducks, which will see John Romero (award-winning game development icon) as creative consultant. Her animation work includes additional music on the 52 x 11 minute Lucky Fred 2 series for International broadcast (Imira Entertainment / Telegael / Toonz Entertainment / Televisió de Catalunya / Aeon Entertainment) working with composer, Anna Rice. She is also working as music arranger on the forthcoming animation series Top Cop, produced by Mooshku for Nickelodeon Jnr UK and Ireland. In 2017, Sarah was 1 of 4 Irish composers chosen to take part in the IMRO | RTÉ Film Scoring Program, which awarded her the opportunity to compose and record an orchestral score for the short film Acorn (Dir. Kevin de la Isla) with the RTÉ Concert Orchestra. As a touring/session violinist, Sarah has, over the years, performed live/recorded with an impressive range of artists including Hozier, Edward Sharpe and the Magnetic Zeros, Glen Hansard, Paul Brady, Shane McGowan, Mundy, The Coronas, Gavin James, Thanks Brother, Damien Dempsey, Mumford and Sons and Ed Sheeran. She is a scholarship recipient of Windmill Lane’s MA in Scoring for Film and Visual Media, as well as an alumna of Trinity College Dublin, The Liszt Academy of Music, Hungary and the Royal Irish Academy of Music. Sarah is a board member of the newly established Screen Composers Guild of Ireland and is represented by Silverstream Music. Annika’s award-winning short film Peel, in which Lauryn Canny won the Irish Screen America Rising Star award for her performance in 2017, was broadcast on RTÉ Shortscreen last August to great reviews and will now be available to watch on Aer Lingus flights until May 2019. Mairead is 29 years old and based in Spiddal, Co. Galway and in May, she set up her own business. She has years of industry experience as an assistant director and in casting and now works for herself. She has set up and manages a business called West Coast Casting. She supplies, extras actors, models and anyone with special skills or talents to productions coming to film in the West. She can source whatever a production may need and works through both the English and Irish language. Last October, Hayley won a Special Commendation Award from the Press Council of Ireland for her First Class Honours Film degree on the work of Guillermo del Toro. She was the first person to receive the award and it was the first Film Studies piece to be recognised by the Press Council. Click here for a link to an article featured in the Irish Times. In the past year, Karen has produced a musical theatre show for THISISPOPBABY. Working with Bankhouse Productions, she’s produced an award-winning feature film, Dive, which went from script to cinema release in 66 days and won Best Feature Film at the Dublin Independent Film Festival. It played in select cinemas nationwide in May 2018. 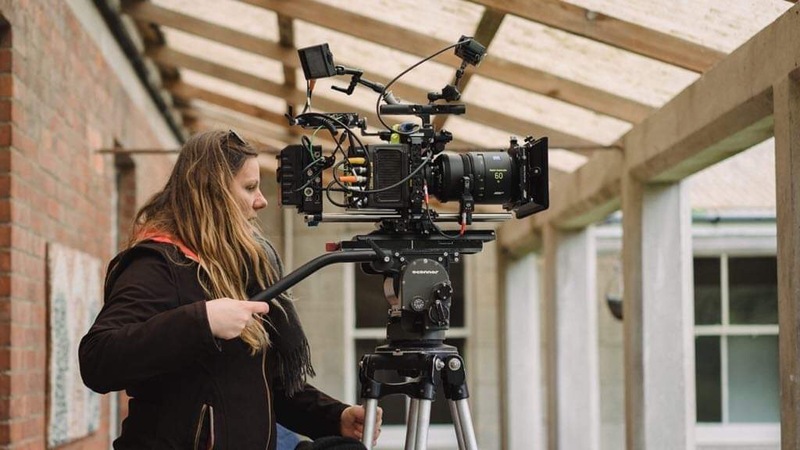 She has also produced an award-winning short film, The Shift, which won Best Cork Short at The Cork Film Festival in 2018 and was also associate producer on two documentaries, The Evolution of Success (just released) and Streetleagues, Homeless World Cup Documentary (in Post Production). Bonnie’s short, All In Good Time was commissioned by RTÉjr as the Irish entry for the EBU Children’s Drama Scheme ‘Message in a Bottle’. This comic fantasy is about two children, one set in 1918, the other in 2018, who magically communicate across time through messages in a bottle and help solve each other’s problems. This short has picked up nominations and awards at over 10 festivals, including the Richard Harris International Film Festival, the Waterford Film Festival, the Riga International Short Film Festival 2018, Latvia and will be screening at many more. Maureen has worked on several shorts which are presently in the midst of their festival runs. However, her film SPA Weekend (a no-budget feature) has been selected for the Female Filmmakers Festival of Berlin 2019. Watch the trailer now online. Iseult Howlett and Neasa Wrafter both worked on a short film called Early Days which has been doing the festival circuit in the last year and picked up a few awards along the way. So far it’s been selected for: Galway Film Fleadh – Nominated for Best Short, Best Debut & Best Cinematography; London Irish Film Festival – WINNER Best Irish Short; Raindance Film Festival; Harrogate Film Festival – WINNER: Best Drama, Critics Choice & Audience Award; Aesthetica Film Festival – Nominated Best Drama; Cork Film Festival – Nominated Grand Prix Irish Short (Oscar Qualifying) ; Kerry Film Festival – Nominated Best Short; Clones Film Festival – Nominated Francie Award; UK Tweetfest – WINNER: Best Short, Best Actress (Maimie McCoy) & Audience Award; Mental Health & Arts Festival, Lisbon – Finalist; AuContraire Film Festival, Montreal; San Francisco Irish Film Festival; London Short Film Festival; Dingle Film Festival; Belfast Film Festival – Nominated Best Short; and Festival du Film D’Aubagne – Nominated Best Short Drama & Best Original Score. Natasa Paulberg’s score for the 2018 National Australia Bank Advertising Campaign (Clemenger BBDO) was nominated for the Jerry Goldsmith Award for Best Music in Advertising & Promotion and her piece Cellar Door for Best Free Creation. A performance by UCD Choral Scholars of Natasa’s piece, A Star which features the poetry of Patrick Kavanagh, has been included on their recently launched CD titled Perpetual Twilight (Signum Records UK). Shauna has developed and produced a number of productions including the documentary The Missing, Cora Staunton – The Greatest Ever, Policing Paddys, Ireland’s Fittest Mum, The Only Gay in the Village, Dream House, Raised By The Village to name a few as well as producing online content for the likes of Clubify, Liberty Insurance and Ford. Most recently the online digital campaign Ready for the Real Road for Liberty Insurance, which she produced and directed, won the award for best digital marketing media campaign. Last year, she developed, filmed and produced the sports feature-length documentary about Irish GAA sports star Cora Staunton. One of her next projects to air in the coming weeks is a documentary surrounding the disappearance of Fiona Sinnott. She is currently in New York developing a new show and looks forward to getting more Irish content and female-led programmes on an international platform. This year, Susie was nominated for a prestigious award from BFDG (British Film Designers Guild) for her production design on the BBC series Mrs Wilson. Imogen Murphy’s film Cry Rosa was nominated for a Royal Television Society Drama Award at end of last year. Dianne’s 2nd short documentary film EL HOR, produced by Bafta-winning producer Brian J Falconer from Out of Orbit, funded by Bridging The Gap (NI Screen & Scottish Documentary Institute), had its world premiere at Edinburgh Film Festival, screened at Inverness FF, was nominated for Best Score at Underwire, screened at Cucalorus FF, was a Festival highlight at Cork International Film Festival (which also screened a film she scored, ‘Stigma’ by Helen Warner, which won Grand Prix Irish Short – Academy Awards longlisted 2020). EL HOR has opened for The Favourite at Triskel Arts in Cork for four nights and just won the Michael Dywer Discovery Award at Virgin Media – Dublin International film festival 2019! (See Critics Choice Jury announcement attached..). EL HOR will be screening at this year’s Belfast Film Festival and opening the European Experimental Film section at ÉCU, The European Independent Film Festival in Paris with more festival announcements to come. Katie is a new WFT Ireland member and has been very busy in the last year. All three projects she’s highlighting below are LGBTQ-oriented and are achievements managed while working a full-time day job as a producer in the AV studio of HMH, a multinational learning company. Short Screenplays: She has been nominated for 17 screenwriting awards in total and won 4 awards. Most of these are on the festival circuit but also include competitions like the Creative World Awards, in which she came in the top 15. 13 of these nominations were for her short screenplay In Orbit. Awards for In Orbit so far include a live pitch competition at the John Lyon’s Theatre in Covent Garden at London Short Series, and Best LGBT Screenplay at the New Renaissance Film Festival, Amsterdam. With this project she also placed third in the short drama categories for the Hollywood Hills Screenwriting competition and Bucharest ShortCut Cinefest. Wins for other projects include Best Short Screenplay at the Satisfied Eye Film Festival with Lambing, a rural story about young new parents who discover their baby is intersex. Feature Screenplay: Katie co-wrote her first feature film over the last six months or so with Graham Cantwell. Lily is an adaptation of his IFTA-nominated short film of the same title and is presently in production. Directing & Producing: As well as writing In Orbit, She took the plunge last month and directed and produced her own short for the first time. She cast Áine Ní Mhuirí, Olwen Fouré, Claire J. Loy and Sarah J. Kinlen as the lead protagonists and Michael-David McKernan as the interviewer. Also on the project were WFT Board Member Jaro Waldeck as DOP, Caoimhe Hernon as AC, Emer Kinsella as Composer and Sound Recordist Caimin Agnew (Oscar-nominated Detainment). Jo was born in Northampton and holds a PGCE in Secondary Education, BA Hons inTheology & Media and a Post Graduate Diploma in Screen Acting. Jo was selected by Directors UK as a mentee to Jon East on Killing Eve (BBC America), a rare opportunity that has allowed her to develop her own unique style for TV and film directing, a style that is attracting much attention and seeing her work being acknowledged by the likes of BBC and high profile cast such as Fiona Shaw. Represented by Pauline Asper, Jo established herself as award winning and versatile with titles such as Deirdre, Cover Me, The Gunman, Portalis, and Entrance No Exit. Jo is attached to a new Irish TV Mini Series being produced by Rachel Gold called Winner. She is also in development as director and creative producer for a new TV thriller with LION TV based on ‘Follow Me’ by author Angela Clarke. She has a feature in development: Deirdre of the Sorrows, which is being produced by Jonathan Finn (Billy Elliot), Catherine Morshead (Downton Abbey) and Jo Nolan (Chalet Girls) and already has Tara Fitzgerald (Game of Thrones) attached. One of her shorts is being screened on 8th March with RHIFF. Cara works as a freelance film editor and director. She is currently directing a documentary about Bangor-based contemporary dancer, Oona Doherty, Welcome to A Bright White Limbo (working title), funded by Screen Ireland as part of their last Real Shorts round. She was editor on Oonagh Kearney’s award-winning short Five Letters To The Stranger Who Will Dissect My Brain. This film has just won best Irish short at the Virgin Media Dublin International Film Festival. She was also the editor on Jump Girls – a two-part documentary series for TG4 that was broadcast in February, 2019. Helen O’Reilly is a writer and director whose debut film ‘First Disco’, is a coming of age comedy set in 1983. ‘First Disco’ started its festival run in January 2019 and has won awards at the Virgin Media Dublin Film Festival, Cinema on the Bayou Film Festival in Louisiana and the Chicago Irish Film Festival. It is also an official selection of the Oscar qualifying 42nd Cleveland International Film Festival, The Myrtle Beach International FF, the 52 WorldFest in Houston, The Kansas City International Film Festival, The FirstGlanceFilm Festival in LA, and The Fort Myers International Beach FilmFestival. Closer to home, Helen is excited to be screening at the Fastnet Film Festival, the Belfast Film Festival and the BAFTAqualifying Carmarthen Bay Film Festival in Wales. Helen is going to make another short film in 2019 and has written a number of television shows and feature films. Síle Culley works as the Sales Executive at Altitude Film Distribution, an award-winning independent distributor based out of London. In the last year, Síle and her team won a Screen Award for “Best Campaign of The Year” for Loving Vincent, as well as deliver the UK release for box office sensation Black 47. Síle was also recently selected to attend Berlinale Talents, the filmmaker residency at EFM, where she was picked out of 3,000 applications as an emerging film professional. Only two other Irish people were picked amongst the 250 filmmakers, including Dublin-based producer Jessie Fisk from Feline Films. A huge congratulations to all the female-identifying members of the Irish Film Industry, who are making their mark both locally and on an international level with their skill, talent and tenacity. We are proud to represent your interests no matter what your field or skill set, and are delighted with your success so far in 2019.